1. May – 30. July 2016 Kristina has a solo exhibition with 28 art works at DEUTSCHE BANK BERLIN, Branch Otto-Suhr-Allee. Out of 35 000 artists in Berlin, 7 000 of them are painters, Kristina was invited. Deutsche Bank shows two artists per year. From January until December 2016 Kristina has a solo exhibition at the luxury and spa Helston Hotel 5*, Guangzhou. Her paintings are on display at the Art Hall. If you are interested in any of the paintings, please, contact the artist personally or ask at the hotel reception. UNESCO accepted donation of a painting from Kristina. The painting is hanging in the library of the “Institute For Lifelong Learning” in Hamburg/Germany. In the same location there is a solo exhibition, 22. October 2015 – 10. March 2016. View photos here. 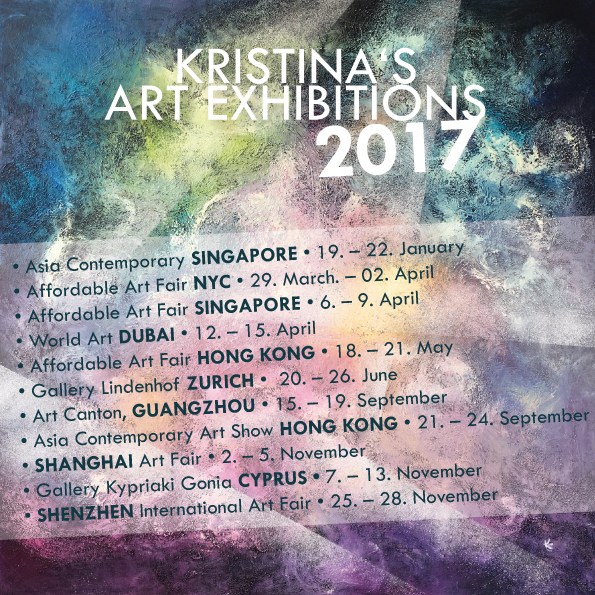 Kristina has a solo exhibition for a whole year at the GUANGDONG MUSEUM ART in the Art Café “Fosweet Café” in Guangzhou. invited by the gallerist, who is also collector of her art.